According to a recent news report in The Adelaide Advertiser, a fire believed to have been deliberately started in a wheelie-bin caused an estimated $50,000 damage to a Murray Bridge church building. 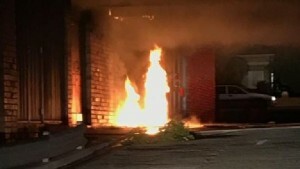 A spate of wheelie-bin fires also occurred earlier this year on the Sunshine Coast – when arsonists set fire to at least eight of them in Caloundra. Wheelie-bin fires are in fact quite a common occurrence according to some sources. Bins that are unsecured and full of refuse can also be like an arsonist’s dream – all that lovely flammable material, just sitting there waiting for a match! This makes it essential to set up fire-prevention strategies when handling wheelie-bins at your church or worship centre. Store your bins in locked areas where possible so they are not accessible to the public – such as behind locked gates, in a padlocked shed, or inside the building. Never place wheelie-bins alongside an external wall as bin fires could spread quickly to the building. Instead, bins that are kept outside should be stored at some distance away from buildings. Only fill bins with permitted materials, and do not overfill. If your bins are regularly filled to overflowing, you may need to consider using additional ones. For extra security consider using lockable bins, or a lockable outdoor bin-stands. Other strategies for reducing arson and fire risk include securing gates after hours, installing alarm systems and / or CCTV, and ensuring you have good lighting around your premises. It’s also important to regularly clean up rubbish from around the property, and to have roof gutters regularly cleared of debris. For more details on fire safety, check out these other articles on the CCI website. Fires are not the only problem that can occur with wheelie bins unfortunately. Injuries can happen when bins are over-tilted for example, especially when being wheeled down a slope. They can also occur when bins are over-filled and / or are too heavy for the handler. These situations have on many occasions resulted in falls and back injuries. Move bins one at-a-time – never try moving several at once. Use both hands when pushing bins, and use the flattest route possible. Never try to lift wheelie-bins or to empty them manually (e.g. such as when emptying into an industrial bin). Consider using manual or motorised trolleys to transport bins. Keep bin lids closed to deter vermin and to reduce unpleasant odours. Don’t feel you should be able to move bins all by yourself. If they are too heavy or difficult to handle, make sure to ask for help. It might seem like a small thing, but wheelie-bin safety can greatly reduce the risk of fire and manual-handling injuries and the need for lodging insurance claims. If fire or property damage from wheelie-bins does occur however, contact your CCI representative to report the incident and to discuss the option of an insurance claim.